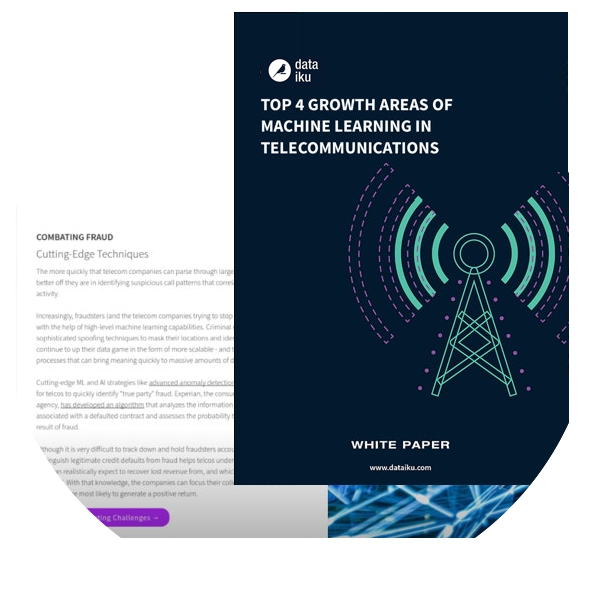 Understand how machine learning and AI offer opportunities in telecommunications to shift the paradigm everywhere from troubleshooting to service, marketing and fraud detection, & everything in between. ML and AI Transformation is Here. If there is one industry that should be leveraging data in every way possible, it’s telecommunications. And yet, experts say that the telecom sector has only just begun to explore the potential of data science. A study by McKinsey, Telcos: The Untapped Promise of Big Data, based on a survey of leaders from 273 telecom organizations, found that most companies had not yet seriously leveraged the data at their disposal to increase profits. And only 30 percent say they have already made investments in big data. A brief overview of the state of the industry and where the largest improvements can be made. A full breakdown into four of the largest opportunity areas with specific strategies for getting started. An in-depth look at how exactly machine learning, and more specifically, AI, can be leveraged and where for the biggest bang-for-buck change.